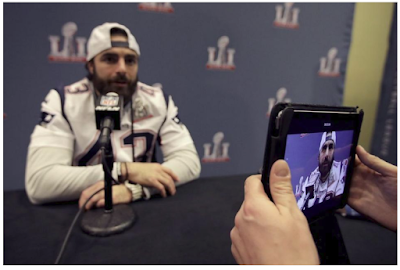 Nate Ebner rode in a Super Bowl victory parade through the streets of Boston on Tuesday. It was Ebner’s third such celebration in his seven years with the New England Patriots. In some ways, it might have been the most meaningful. Ebner, a special-teams player, tore a ligament in his right knee late in the 2017 season. He returned to action only eight months after his surgery. He wasn’t at 100 percent throughout the season, but he persevered. “It was a tough year, but I made it out alive,” he quipped. For Ebner, it was just another chapter in his unlikely career. Growing up, he played rugby not football (and he represented the United States in the 2016 Olympics). He decided to walk on to Ohio State’s football team and earned a scholarship his senior season. New England made him a sixth-round draft pick, and he has been an important cog on the Patriots’ three championship teams in the last five years. “My first one was awesome because it was my first one,” Ebner said. “The second one was special, too, because special teams played a pretty big role in that Atlanta game and it was amazing to be part of that comeback (from a 28-3 deficit). His teammates voted him this year’s recipient of the Ed Block Award, which honors sportsmanship and courage. The Super Bowl was considered an aesthetic dud because of both teams’ offensive struggles in New England’s 13-3 victory over the Los Angeles Rams. In his role, Ebner found plenty of beauty in it. Ebner got to share the latest Super Bowl win with one of his former Buckeyes teammates. Defensive end John Simon joined the Patriots this year after the Colts released him. “John’s a great guy for this team,” Ebner said. “John doesn’t say a whole lot, but does the job really well. He’s had some ups and downs throughout his career as far as teams putting him in weird spots and a couple of health things. Simon’s wife, Brittany, gave birth to their second son the week before the Super Bowl. “They’ve had quite the two weeks,” Ebner said. It culminated for Simon and Ebner with the Super Bowl victory and Tuesday parade.